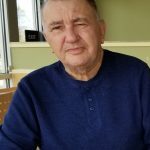 Yorktown, VA – John Henry Hines of Yorktown, VA, went to be with the Lord on Wednesday, January 16, 2019. He was born on October 26, 1932. He worked with his family oystering for many years on the Deep Creek in the boat named after my sista, Julianne. From there, he went on to work at Horne Brothers in Newport News, VA. He is survived by his loving wife, Mary ”Sis” Radcliffe Hines, daughter and son in law, Pamela Hines Smith and Thomas “Buck” Smith, 3 grandchildren, Ashley “CoCo” Smith Anderson and Jim, Ryan Hunter “BoBo” Smith and Stephanie, and Kaci Lauren “YoYo” Smith and Marshall Riordan, 4 great grandchildren, Lily and Jacob Anderson and Sophia and Brooklynn Smith and grand dog Bayley, Sister Alice May Taylor of Indiana, brother In Law John D. Radcliffe, a nephew Randy (Ranny) Hines that was the son he never had and many nieces and nephews and longtime dear friends that he went to dinner with every Friday night for 40+ years; Hank Rose and Frances Estes as well as lifetime friend William “Dodolly” Bulls. He was preceded in death by his daughter Julianne Hines Collins, parents Clarence C. Hines, Sr and Evelyn Jenkins Hines, brothers Clarence (Bug) Hines, Thomas (Tommy) Hines and Bunnie Ann Dodge and long time friends Geri Rose and Marvin Estes. The family will receive visitors on Saturday, January 19, 2019, from 10:00 to 11:30 AM at Amory Funeral Home, Grafton. A graveside service will be held at 2:00 PM on Tuesday, January 22, 2019, at Peninsula Memorial Park. Memorials may be made to the charity of your choice.